Arrive and check into accommodation. 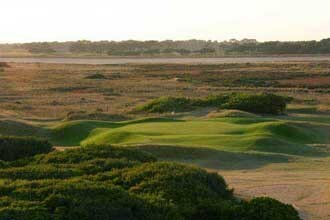 The Beach Course at Thirteenth Beach Golf Links was opened in December 2001. 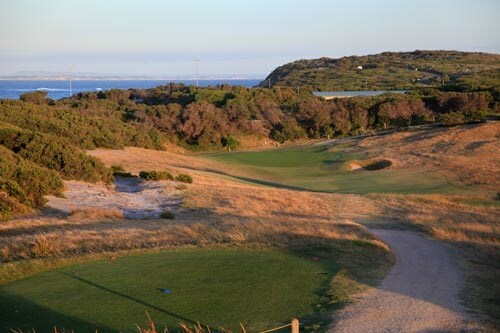 Located on the stunning Bellarine Peninsula in Victoria, the challenging and natural links style course has received high accolades by many golfing publications. Many of the holes on the course wind their way through high valleys and the fairways provide pure couch fairways from which to hit your shots. The sandy soil upon which the golf course sits ensure excellent drainage in even the heaviest of downpours. 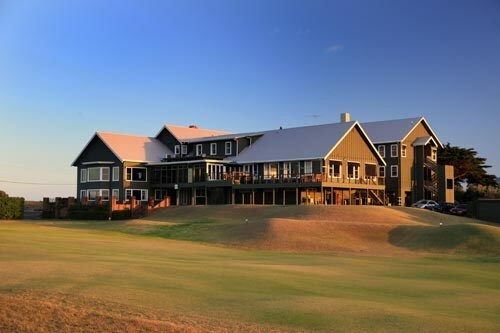 Barwon Heads Golf Club has 19 ensuite rooms, and a variety of packages are available incorporating your stay with golf, dining and entertainment. 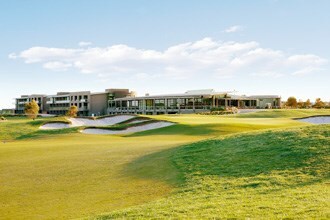 The Sands Torquay is a unique links course that winds its way through the natural environment of the coastal location. 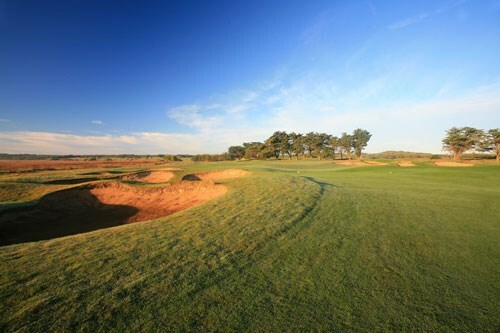 Designed by Stuart Appleby, the course demonstrates his flair for providing a challenging and unique experience for the golfer. This magnificent course has been constructed with knowledge and experience to create a challenge as well as being an enjoyable play. 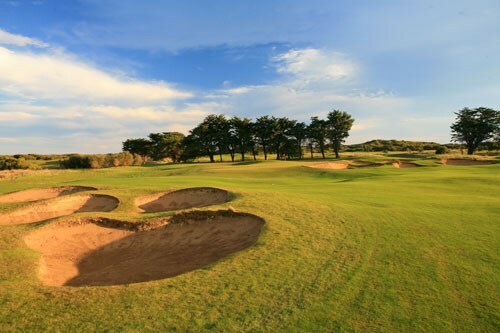 The Barwon Heads Golf Club is located near the Bass Strait, and the sand dunes along with the weather conditions provide a course reminiscent of famed Scottish links. While not especially long the links will test golfers of all standards with cleverly positioned hazards, subtle slopes and greens, along with challenging tee positions. The wind ensures that the course rarely plays the same way twice even in the one week. 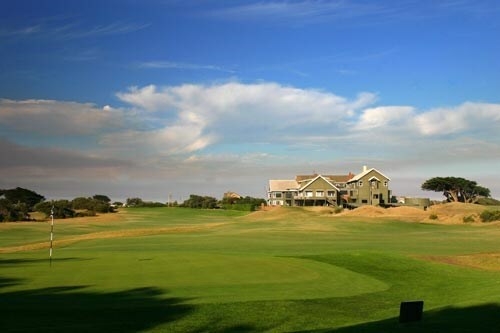 Thirteenth Beach Golf Links was once an asparagus farm and is now one of the finest golf courses in the land. 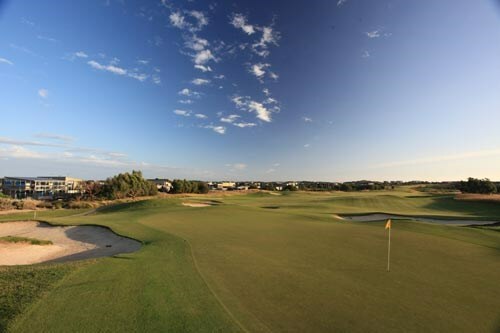 Set on the stunning Bellarine Peninsula in Victoria, Thirteenth Beach is a 36 hole golf and residential complex. 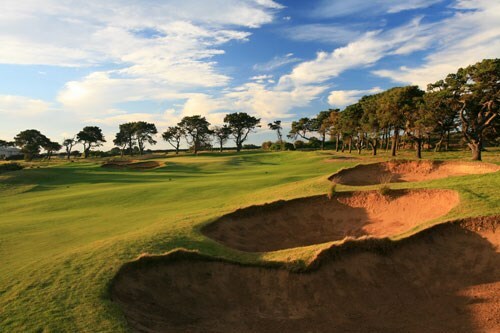 The challenging and natural links style Beach course has already received high accolades. 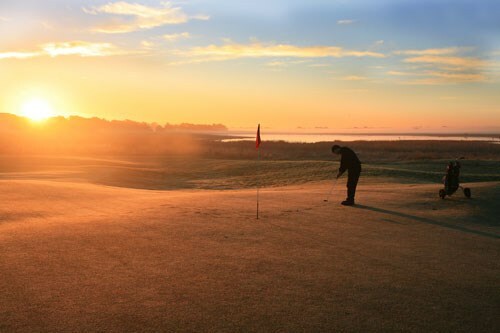 The Creek course, designed by Tony Cashmore in conjunction with 6 time major championship winner Nick Faldo, is a wonderful complement to the Beach course. Check out of accommodation and head home. 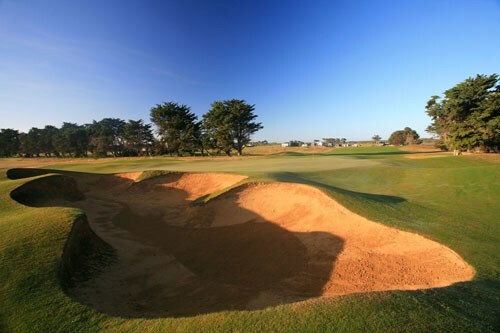 The Links at Barwon Heads regularly rates in Australia's top 30 courses. 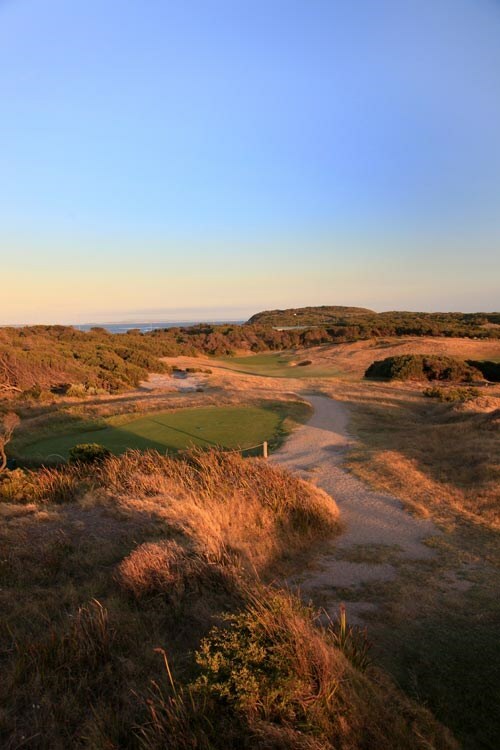 The nearby Bass Strait and sand dunes along with the weather conditions provide a links reminiscent of famed Scottish links. The undulating terrain, in harmony with the natural features of the land will ensure that you will remember time spent at Barwon Heads. While not especially long the Links will test golfers of all standards with cleverly positioned hazards, subtle slopes and the greens along with challenging tee positions. The wind ensures that the course rarely plays the same way twice in the one week. The greens are predominantly of Poa Annua and are maintained to the highest standard. It is their practice that the greens be cut for guests every morning, so a true and fast surface is virtually assured. The opening hole is a friendly par four. After a good drive, the uphill pitch to an elevated green requires good judgement of distance. The 2nd hole is very demanding at this length. A tough par three. A classic links hole, the 3rd plays into the prevailing southwesterly, often calling for two wood shots. The tee shot must be placed left of the three large limestone pits. This turns the hole into a slight dogleg with an uphill second shot. From the high tee, the view of the rugged coastline ranges from Lorne to Cape Schanck. 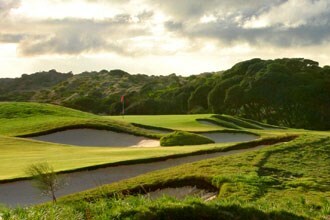 With the Bass Strait just short pitch away, the wind is always telling factor on this par three. The two-tiered green requires a good touch and good nerve. The 5th is reachalbe in two shots with the prevailing wind. This hole tempts the golfer to flex his muscles. Not so the 6th, where the landing area from the tee lies along a steep ridge. Any ball not struck surely off the tee will make the golfer work hard. The second shot is often uphill to a firm green. More difficult still is the 7th. A good drive will just carry the ball over the brow of a hill leaving a mid iron shot to a semi-blind green. With only 146 metres to negotiate and a reasonably generous green, this hole is the last chance for the golfer to relax for some time. The difficult stretch begins with the 9th. As the fairway is divided into two sections, the tee shot must be very accurate to avoid the thick ti-trees, which entirely surround this dogleg left. The second also must be straight, often with a wood into the prevailing wind. Your opening shot is out of a shoot of ti-trees and into an avenue of majestic cypresses. The prevailing breeze often encourages the golfer to throw caution to the wind. A 7-iron is normally required for the second shot, with enough carry to avoid trouble in front of the green. This hole becomes more difficult the closer you get to the green. The drive is amenable, but the approach is played to an elevated green, with four deep bunkers awaiting any shot not struck with enough courage. A par here is good golf. 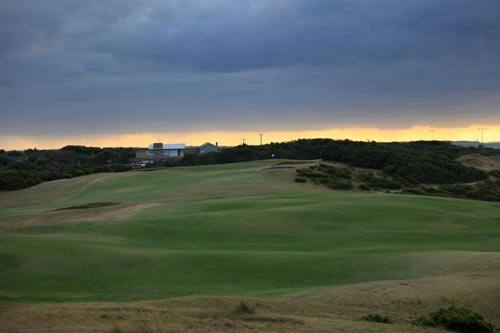 At this length into the prevailing wind, the 12th is Barwon Head's most difficult hole. With trouble down the left and bunkers and water on the right, the golfer has no choice but to hit a good drive. A long second shot finds a slippery green, here the best position is below the hole. 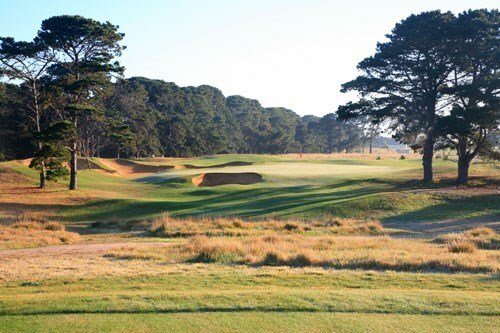 This par three has been rated by golfers from around the world as equal to any in Australia, perhaps in the world. The club needed here can vary greatly, due to the exposed landscape and the perpetual wind. At the 14th, you head towards home. 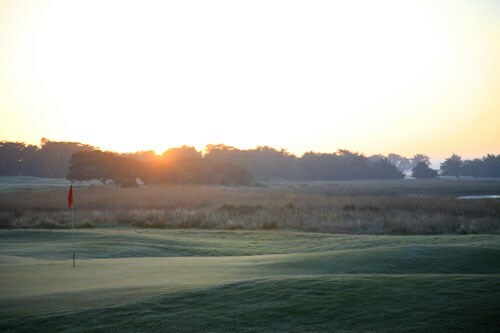 From the tee avoid some thick marsh land and bunkers on the left. The bunkers near the green are also to be avoided. The 15th is more difficult. After a good drive, a wood maybe needed to reach a well guarded green. The 16th provides the last good birdie chance. The hole needs a long drive to open up the green. If the pin is on the left side on the green, be careful of the greenside bunker. This hole is a friendly par three, provided you stay out of the surrounding ti-trees. 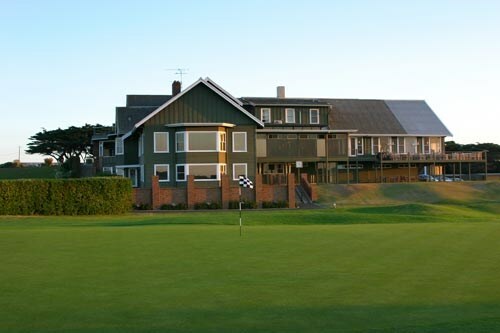 The stately, old fashioned clubhouse overlooks the 18th. The uphill second shot always requires one more club than you would expect. 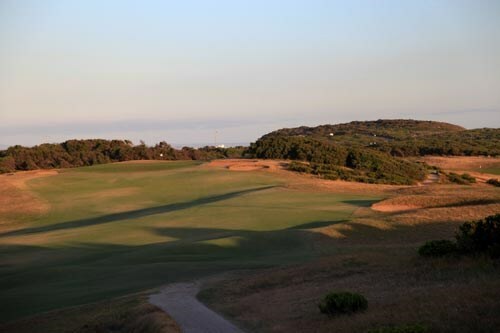 This unique links course winds its way through the natural environment of the coastal location Torquay, at the footstep of the famous Victorian Surfcoast. 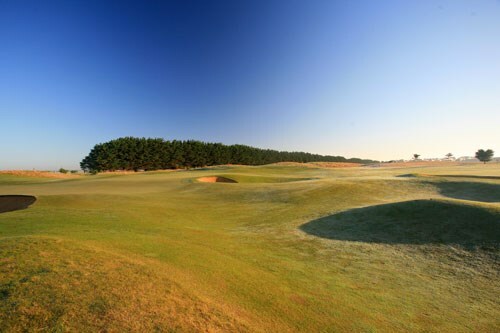 Designed by Stuart Appleby, the course demonstrates his flair for providing a challenging and unique experience for the golfer. This magnificent course has been constructed with knowledge and experience to create a challenge as well as being an enjoyable play. Located 75 minutes drive from Melbourne or 20 minutes drive from Geelong. The Sands offers Members and Guests all the comforts of a first class course and club. A professionally stocked Proshop, practice facilities, excellent locker and change rooms,Hanners Restaurant and bar, function areas and health club including gymnasium, 25 meter indoor lap pool and tennis courts make The Sands a standout club in every aspect. Neat casual golf attire being a collared shirt and dress pants or shorts is necessary, only soft spike golf shoes are to be worn, with either long or short plain white socks. Tracksuit pants, denim, singlets, brief shorts, joggers and thongs are not permitted on the golf course. Any participants not abiding by the regulations will be asked to leave the golf course. The opening hole is a relatively short par 4, but is tightly bunkered at about 250 meters from the back tee. Long hitters have the option to attempt to carry the cluster of bunkers on the left side, opening up a very short pitch to the green, but the more prudent tee shot might be a three wood just in front of the fairway bunkers. The second hole presents a heavily bunkered vision to the golfer, who may be a bit intimidated by the view. In fact there are at least three good options for the tee shot on the shortest par 4 on the course, but the stage for the round has been set. Golfers will see plenty of sand during this adventure, and they will have to use their heads constantly in order to avoid being trapped. The green here is relatively small and tightly bunkered so precision is the key at #2. At the long third, golfers are asked to add power to their tee shots, but there is plenty of room to let one fly. Most golfers will opt to head left and if you make it over the rise, a clear shot of the next landing position is clear. The green is perched in the air slightly, helping to make this hole a true three shot par 5, but long hitters can have a go in two if they dare. This medium length par 4 offers plenty of room off the tee but has a closely guarded green. The hole is nearly straight away and plays slightly downhill, so it is a good chance for a birdie for those with accurate iron play, if they are not too distracted by the beautiful backdrop of the tidal wetlands. The first par 3 on the course plays into the prevailing wind and borders the wetlands, so it presents an intimidating target. The green is well bunkered on the left side, so a draw is favoured for most pin positions. Only the back right pin placement invites a fade approach. The sixth hole is perhaps the most difficult challenge on the front nine of The Sands Torquay, and it looks even tougher than it plays. The bunker placement in the landing area presents an intimidating picture, but there is in reality plenty of fairway to receive the tee shot. The line of the second shot must be carefully considered, however, as the bunker on the right side is well short of the green and offers a difficult recovery. For many golfers a little humility in selecting a safe bogey route may be the best strategy. At 162 meters the seventh hole is not long, but it is closely and somewhat deceptively bunkered, so having the right club in one's hands may not be a simple matter. The prevailing breeze is slightly across the line of flight and will have a tendency to knock lofted shots down and to the right of the green. This medium length par 4 has water down the entire right side, wrapping tightly around the right side of the green. A series of large bunkers protects the left side of the hole and helps turn the hole slightly to the right. The green falls away slowly to the right side, making the pin position on the right side of the green a real challenge. There is a clear risk-reward choice for the tee shot. Only a golfer, who challenges the water off the tee, will have a reasonable approach to the green on the second shot. Golfers playing away from the water off the tee will have a much more difficult journey to this closely guarded green. The back nine starts with a medium length par 4 that doglegs a little to the right. Golfers looking for birdies should work hard here, as it may be the last good chance. A good tee shot should challenge the right side bunker, opening up the green for the approach, especially the difficult left side pin position. 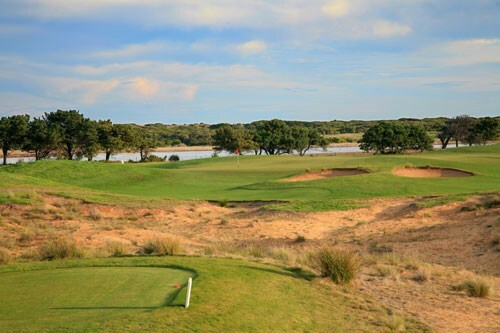 The long eleventh hole embodies all of the natural elements of the Torquay site - sand dunes, tall grass, Moonah trees, and even some rock outcrops. 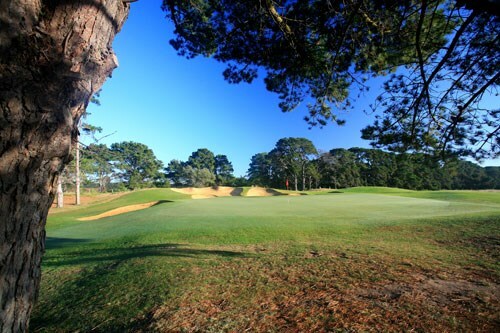 Thankfully, the wind is normally at the golfer's back, so a well hit tee shot should clear the small Moonah trees op the left center of the fairway. The fairway splits around a natural slope with four embedded bunkers and rises to a well-protected green, gently tucked into the dunes landscape. If golfers can keep their focus here and not become distracted by the natural beauty of the hole, par is possible. 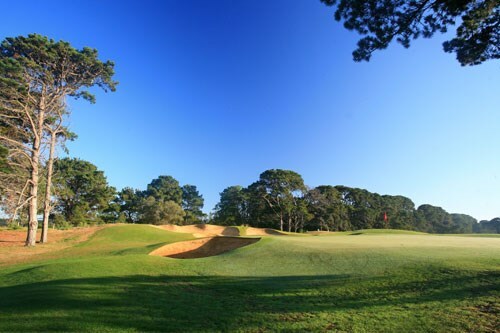 This par 5 plays from an elevated tee to a fairway bordered tightly on the right side by a large grove of Moonah trees. Bunkers on the left side define the tee shot and gently bend the hole to the right. The green bends back to the left a bit and has a wetland backdrop. The shortest hole on the course plays sharply uphill onto a high ridge that dominates the next two holes. Although the green is pitched towards the golfer, the putting surface will be blind for the most part, so golfers will need to trust the yardage on the card and give the club its full value. The fourteenth hole is an excellent example of creating a natural look in context with the stunning surroundings. Although the existing site was not much to look at, the distant dunes backdrop offered inspiration for what has turned out to be one of the most beautiful holes on the course. And it's plenty challenging, especially the second shot to a green set carefully on a side slope, but the wind is normally at one's back, so tee it high and let it fly. This relatively short hole is no patsy. The wind is nearly always a factor on the ridge and the drop to the wetland on the entire right side of the hole is severe. This hole begins the four-hole finish of the golf course that will challenge even the best golfers. The last par 5 on the course plays across a wetland into the prevailing wind, from an elevated tee. Having successfully reached the generous fairway, the golfer is faced with a narrow opening about 50 meters short of the green. Two big shots will clear the gap and leave the long hitter with an easy pitch, but the wiser play may be short of the bunkers leaving a slightly longer approach. This is a long hard par three that plays into the prevailing wind. The hole sets up for a slight fade shot, and is open enough to allow a run-up approach, but there are plenty of bunkers to catch errant shots. The golf course ends with a medium length par 4 that bends to the left around a Iarge fairway bunker. The hole plays into the prevailing wind, so it will play at least two clubs longer than the card on most days. The green is closely bunkered on the left side, making the right side of the fairway a better angle to the pin. 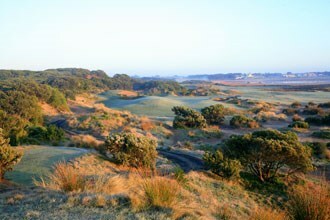 The Beach Course at Thirteenth Beach Golf Links was opened in December 2001. 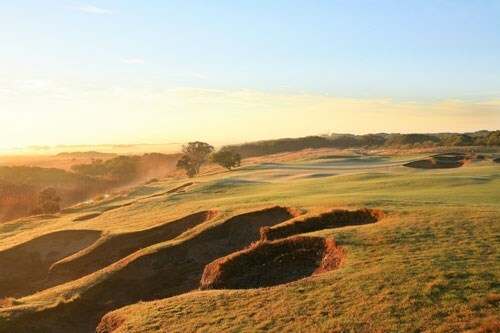 The challenging and natural links style course has already received high accolades, being voted in the countries top 25 golf courses (Golf Australia magazine) and the 12th best public access facility (The Golf Course Guide). Many of the holes on the course wind their way through high valleys and the natural, moonlike bunkers and scrubbery add to the general unkempt look of the course. That is if you are off the fairway! 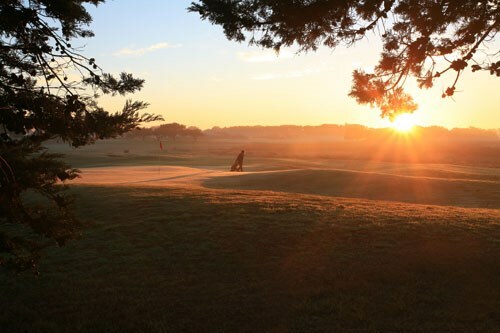 On the fairway you are greeted with pure couch fairways and good course conditioning all year round. The sandy soil upon which the golf course sits ensure excellent drainage in even the heaviest of downpours. The first four holes are relatively open and provide a gentle opening for the rest of the course. Focus on starting well on these holes and this will help to set up a good round. 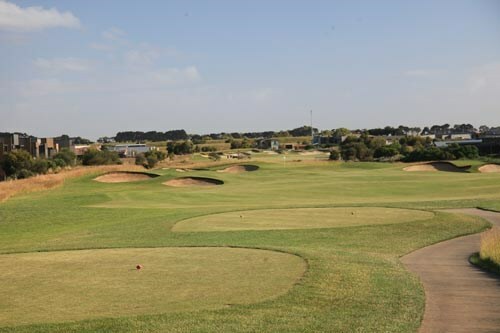 The par 3 holes are a feature of the Beach course at Thirteenth Beach and they provide a series of challenges-moreso from what awaits you if you miss than the green rather than the length of the holes. 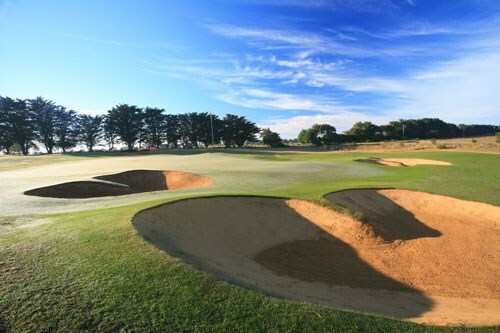 Set on the stunning Bellarine Peninsula in Victoria only 60 minutes from Melbourne, Thirteenth Beach is a 36 hole golf and residential complex forming the basis of some very good golf in this fast growing part of the Victorian golfing scene. The perfect opening hole. The 1st hole of The Beach Course offers the golfer the opportunity to get off to a quick start without being a total walk over. A mid to generous landing area allows golfers the opportunity to hit iron or three wood to get their round started. Played carefully the first hole can be a nice safe par, but hit your drive too far off line and double bogey is not out of the question. 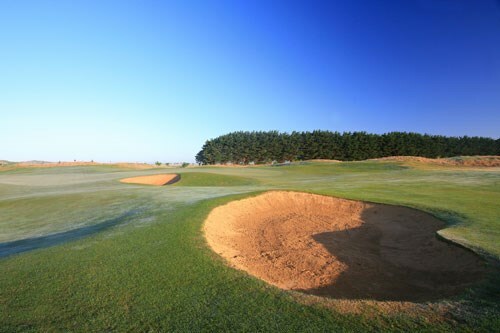 The right hand side of the fairway is guarded by three pot bunkers, with rough and sandy wasteland guarding the left hand side. Three bunkers guard the left hand side of this long narrow green, with a secondary cut of fescue grass guarding the right and back of green. TIP: The safest and easiest way to make four on this hole is to place your drive short of the bunkers on the right hand side of fairway, and hit a short iron to the heart of the green. Longer hitters may like to chance their luck at hitting driver at the green leaving either a putt or short chip to the well guarded green. But of course this is easier said than done on the first hole of the day. A mid to long par 4, its difficulty is affected by the prevailing winds. Framed down the left hand side by a series of houses, a large crop of eight bunkers entice the player to take the short route home. Players are then confronted by a large putting surface that tilts subtly from left to right, but has many varying slopes to catch the player who hasn’t quite gauged the pace of the greens yet. 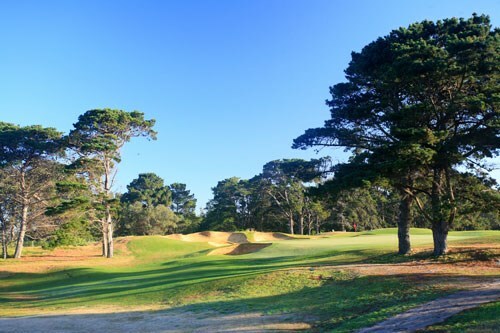 This is the first contact the golfer has with the residential precinct surrounding Thirteenth Beach, and is a fine example of how well houses with strict covenants can blend into the surrounds. TIP: Avoid the bunkers on this hole to perhaps secure that early birdie. This fairway is wider than it seems. There is a small hump that restricts the golfers view of the rest of the fairway. Hit a drive off the left edge of the bunker on the right hand side, then hit your second shot to the fat part of the green. As the green is not deep club so as your ball lands into or just short of the tier that protects the front of the green. A long par three that generally plays into the breeze. This up turned cashew shaped green has a number of pin positions that make obtaining par extremely difficult. Golfers could quite possibly face the longest putt of their careers at this hole, as many a round can be ruined by the early three or four putt. TIP: If your tee shot can’t hit the green be sure that you miss to the short side, as a chip over the large ridge running down the middle of the green can be near impossible. A much criticized par five, architect Tony Cashmore designed this hole to fight against the fast rise of titanium drivers and oversized club heads. On some days players will be required to hit just a long iron off the tee to a small throat of fairway that is guarded by a water hazard on the left and cypress trees and a bunker on the right. If conditions allow and players are able, a long iron or a fairway wood can be used from the fairway to reach the green in two. Regulation par can be made by hitting to the right of the fairway traps, then wedging onto the green from about 100 metres. However this hole is greatly effected by the elements and should be played on its merits. 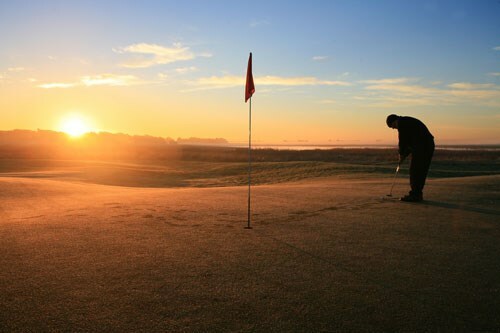 TIP: Any drive left of the lone fairway trap will increase the likelihood of an early birdie. If laying up, the clubbing of the third shot is critical, with bunkers guarding the green short and right and a mixture of fescues and swales guarding the back of the green. Although not visible from the fairway there is a large saddle that covers two thirds of green, golf balls falling into this area will often feed off the green and into the fringe. The mini version of St Andrews valley of sin located at the front of the green should also be avoided. The beginning of the stretch of holes that Thirteenth Beach has become most famous for. Standing on the tee most players are overawed by the sight of this Par 4. The 3 sets of tees for this hole are located next to the old irrigation pump from when Thirteenth Beach was an asparagus farm. The site of the irrigation now lays dormant and cuts diagonally across the length of the hole. Four huge fairway bunkers have been cut into the side of the hill. Masterfully constructed by shaper Barry Hudson these bunkers stand up and rare at the golfer as they look across the first fairway on the drive to the clubhouse. Perhaps the biggest challenge of these bunkers is not their difficulty but gauging how far they are off the tee. Without the help of a course guide the hole appears a lot longer than it actually plays. Given the right conditions the green is reachable from all three tees. But it does require the golfer to carry their drive in excess of 250metres over a water hazard and bunkers, another example of Cashmore incorporating risk and reward into his players rounds. TIP: Whilst the temptation to impress playing partners or chase that elusive two may be realistic, many a round has been ruined as players miscue or hit flippy hooks into the water. The safest and most effective way to play this hole is to hit a three wood or long iron from the tee leaving about 100 metres to the hole. This allows the golfer to attack the flag stick and hopefully make a birdie on this tiered green. Another Par five to attract criticism and praise from golfers around the world. A true three shot hole, players hit from the tee towards a large swampy marshland that is an extension of Murtnaghurt lagoon. The hazard encroaches onto the fairway at approximately 225 leaving the golfer only a small bottle neck that is approximately 20 metres to land drives longer than this distance. It is a rare par five that dictates the way players must play the hole. Only on the strongest of tailwind days can this hole be reached in two strokes, this is what has been criticised by golfers. Golf technology is stretching golf courses to their absolute limit. Modern courses are stretching over 6500 metres and beyond. 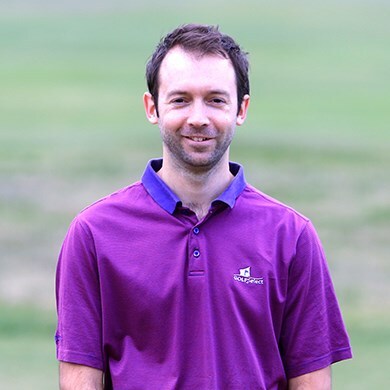 By creating the true three shot hole Cashmore has tried to restrict the effects of technology, effectively taking the driver out of play. After a successful lay up players can then advance the ball into the fairway, and finally shoot blind to a green protected by dunes reminiscent of those seen in Irish golf pictorals. TIP: From the tee select a club that can hit 190 to 210 metres. This will leave you well placed behind the swampy marshland. Calculate the distance to the final fairway bunker and aim to land just short of it. This will leave a wedge oro a short iron into the green. Be sure to leave your third shot beneath the hole leaving an up hill putt to one of the many hole locations on this green. 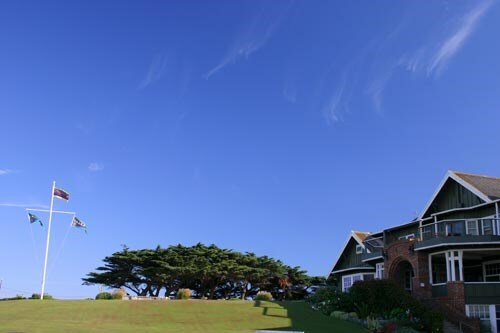 Working your way back up the nearby sand dune to this enclosed tee, the golfer faces one of the most stunning views of the golf course. Looking back across the recently completed sixth hole, the sparkling waters of Murtnaghurt Lagoon and onto the clubhouse it could be quite easy to become transfixed in the surrounding scenery. But the seventh hole requires much greater respect. This magnificently shaped green represents all the wonderful aspects of Links golf. To the left of the hole a small dune sits with two bunkers. On the right hand side of the dune a large grassed area feeds all balls striking its vicinity onto the green. At the front of the green a large tightly cut apron allows the golfer to bounce their ball onto the firm putting surface. The right hand side of the green is protected by many bunkers, including a large deep bunker that protects the back of the green from any shots the slightest bit overclubbed. The first truly great par three on the course. TIP: If the pin is in the middle or to the right hand side of the green, aim at the green side traps to the left and work the ball back to the centre of the green. The natural lie of the land will bounce the ball towards the pin. If the pin is in the left bowl, good luck! Similar to the seventh hole the view from the tiger tees here is mind blowing. This hole has changed quite considerably since the course first opened in December 2001. From the two sets of tees the golfer is faced with a large landing area that bottles into a small neck of fairway protected by bunkers. In typical Cashmore style the landing area is quite large for the not so experienced player and gets narrower the further the ball gets advanced down the fairway. A small bunker on the left hand side of the fairway, and two fairway bunkers on the right hand side create this bottle neck type effect. The only bunkerless green on the golf course awaits as players are forced to shoot blindly into this bowl shaped green. It is hard to get it close to the pin on this green as judging the distance can be near impossible. The green is fairly flat with only hole locations at the back of the green causing any real dilemmas. TIP: Play down the right hand side of this fairway from the tee, aiming directly at fairway traps. This will leave the shortest route to the green. The second shot can be played in a number of ways. Because the green sits in a bowl those players just wanting to find the surface can hit the ball in from the right or left and let it feed off the slopes. To get the ball close to the flag, aim directly at the entrance to the green. A strong finish to a tough opening stretch. Whilst good scores can definitely be posted on the front nine, no hole should be taken for granted. The 9th hole posts a much more difficult challenge. From the tee the fairway doglegs dramatically to the right hand side. A large sandy wasteland begins at about 100metres off the tee and stretches the length of the drive. Another risk reward hole that allows players to bite off as much as they can chew. The stony wasteland is unpleasant to play from and should be avoided at all costs. After finding the fairway, the player is confronted with arguably the most difficult approach shot on the golf course. Down wind and down hill to a very narrow green. Strong Par that plays back into the prevailing southerly. The further you drive the ball the more narrow the fairway becomes. The fairway allows the player to hit it left or right off the tee, but the closer you are to the right rough, the further you have to the hole. A long narrow green makes long iron approaches extremely difficult, and a set of three bunkers guard for those shots leaking slightly right. TIP: Drive it down the left hand side trying to keep it as close as possible to the bunkers, this will leave the shortest approach shot to the hole. A ball left below the hole gives the best chance for that elusive birdie. One of the best Par 5’s in the country. A well played hole will deliver a birdie, a poorly played hole could deliver a 10. The property’s perimeter fencing which is out of bounds guards the left hand side, and a set of two fairway bunkers and tea tree guard the right. One of the tightest fairways on the golf course, not only do players have to thread their drive through a series of hazards they must combat the left to right southerly that sweeps this hole. A drive down the middle presents the golfer with an opportunity to hit the green in two, but a poor shot will find trouble with sand and tea tree guarding the green. An undulating green makes putting difficult, but a well struck putt will get its rewards. TIP: Find the fairway at all costs, even if this means hitting three wood or a long iron from the tee. Unless your one of the longer hitters, lay up on your third. There is a small pot bunker in the middle of the fairway, either just short or long of the bunker will give a flat third shot into the green. Locate where the pin is on this hole as depth perception can be quite difficult. Regarded by many as one of the most aesthetically pleasing holes in the country. This natural Par 3 looks and feels like it was on the property just waiting for the grass to be mown and golfers to play it. Like the eleventh, good shots are rewarded with birdie opportunities, but a Par 3 is a fine accomplishment on this hole. Many hole locations determine how the hole should be played, asking the golfer to hit a variety of shots to different portions of this large green. TIP: Take half a club more than what you think is needed and aim for the centre of the green using the back dune as protection. Don’t be short as an up & down is quite difficult. Another piece of architectural artistry. A short walk from the 12th green through a set of dunes, players are greeted with a narrow elevated tee box through a narrow shoot. 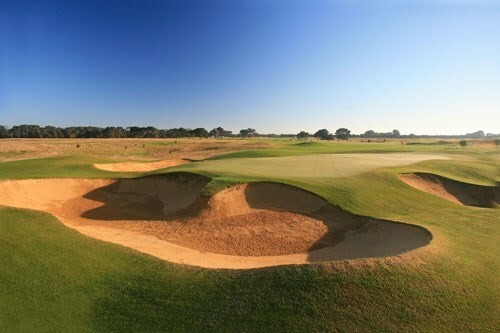 A nest of bunkers guard the right hand side of the fairway beginning at 220m and continuing to the green. Sandy wasteland, tussocks and tea tree guard the left hand side. The green is a small three tiered green, that slopes from left to right, with all balls missing the green coming to rest in fescue beside the green. TIP: Position is everything. Iron or three wood off the tee hit close up to the right hand bunkers. This will leave the best angle to this green. Distance control is everything. Play the ball to the left and let it feed back toward the hole. A strong Par 5, playing along one of the residential precincts. This fairway is wider than it seems, with a lot of room and the best line of play down the left hand side. A set of cross bunkers about 100metres from the hole are in place to capture those trying to lay up, with the deep bunkers guarding the left side of the green. TIP: Hit it down the left side off the tee, don’t even flirt with the fairway bunkers on the hill as they shouldn’t be in play. For the longer hitters shoot at the green and avoid the bunkers on the left, for those laying up, aim to leave yourself about 120m. This green is also quite long, so ensure enough club is taken for the approach shot. The start of a strong quartet of holes. The fifteen requires players to hit a long iron or three wood to the end of the fairway, approximately 230m off the tee. A mid to short iron is required. The southerly breeze plays great effect on this hole, with most second shots worked in from the left side, bunkers guard the right side of the green. TIP: Play down the left of the fairway to give the best angle and shortest route into this green. It is better to overclub on this hole as the green is quite long. Avoid the bunkers on the right hand side. The signature hole of Thirteenth Beach: Perched on top of a sand dune this postage stamped size green has ruined many a round as it is surrounded by pot bunkers with severe run offs to tangled fesue grass. Anywhere from a four iron to sand wedge can be used on this hole depending on the wind. TIP: Land it on the green. Take enough club and leave the ball below the hole. Balls missing the green can result in any amount of strokes. Strong modern Par 4. Hole doglegs to the right with players required to hit a long iron into one of the largest greens on the course. Fairway bunkers guard the left and right hand side of the hole, as well as a rocky wasteland to the right. The green is split into four quadrants guarded by a large swale running both vertically and horizontally. A very good test of a players shot - making skills. TIP: Hug the right hand side of the fairway staying close to the fairway traps. This leaves the best angle and the shortest distance to the hole. If the pin is in the front portion of the green the back tier can be used as a backstop. Aim your drive at the apex of the Clubhouse, which is visible in the foreground. You will then be faced with a tricky second shot into a well tiered green, which is well set in the shape of a "bowl". A par on this will be a very good finish. 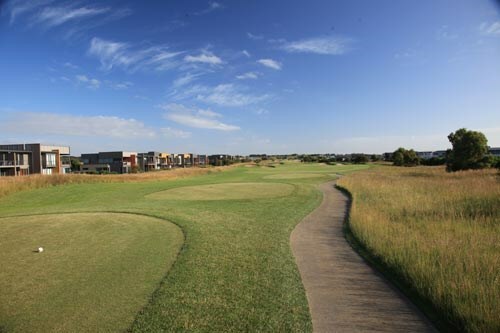 Thirteenth Beach Golf Links was once an asparagus farm however has now been transformed into a 36 hole golf and residential complex set on the stunning Bellarine Peninsula in Victoria. 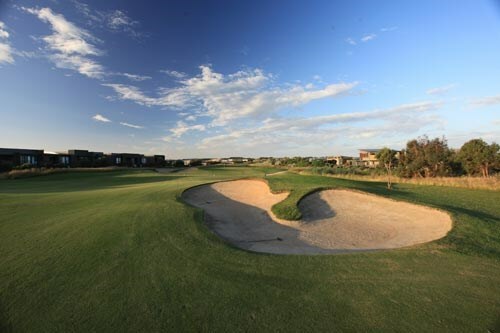 The Creek course, designed by Tony Cashmore in conjunction with 6 time major championship winner Nick Faldo, is a wonderful complement to the Beach course. 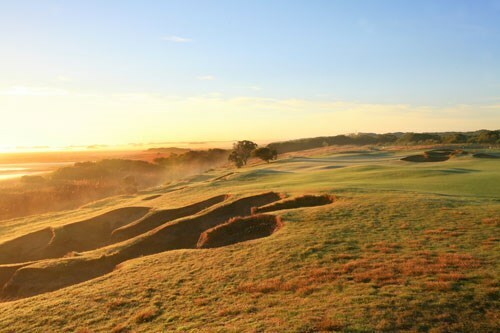 The Creek Course certainly requires much strategy on its big long sloping fairways which are generally wide and open but the myriad of bunkers strategically placed in fairways and around greens ensure the golfer must be vigilant at all times. 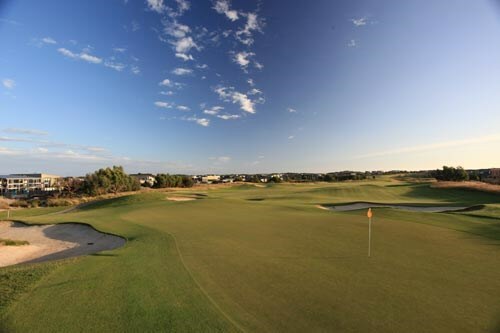 The Creek course has been described to have the feel of the very best of Melbourne's sand belt through its gently rolling terrain and broadly separated fairways. The course abounds with gentle contours, large, multi levelled greens and a routing that meanders its way through scattered pine trees and across open parkland. The par 5 second presents a sea of bunkers left of the green, with more sand on the right. Exposed to the elements, the third typically plays with a lefttoright cross southerly wind. A wide, shallow twotiered green demands accuracy from the tee shot to avoid a difficult putt. Going long here is not an option, and definitely should be avoided. The fifth is the longest par 4 on course, however rarely plays its full length. The drive should be positioned right to avoid protruding fairway bunkers and out of bounds left. Greenside cypress trees create a difficult approach, often necessitating a shaped shot. When contemplating club selection, its better to have more club than end up short. The sixth, a 129m par 3 is already a sensational hole, with a delightful green tucked between mature tortured pines in a setting that was just too good for the designers to ignore. 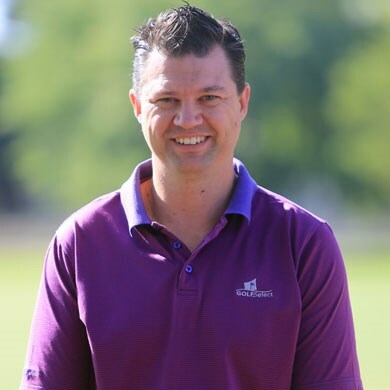 Faldo has predicted that the greenside bunker will rank amongst the world's best, and has retained the services of shaper Barry Hudsen (The Dunes and The Beach Course) for a Faldo project in Kansas, USA. The manmade rocky and sandy 'creek' first comes into play on the 479m par 5 seventh hold, cutting strategically across the fairway just 70m short of the green, and demanding a 'layup' or 'go for it' decision from many. On the 362m eighth the creek is a water hazard down the right of the fairway, before cutting across in front of a very tricky elevated green. The tenth typically plays like a true threeshot par 5 due to its length of over 500 metres. The creek that runs across the width of the fairway influences the second shot, and should be accounted for. Ensure you leave the ball below the hole on a long green that slopes from back to front. The eleventh hold is a monstrous dogleg of 411m, but big hitters can currently cut the corner bunker with their drive and significantly shorten the approach. 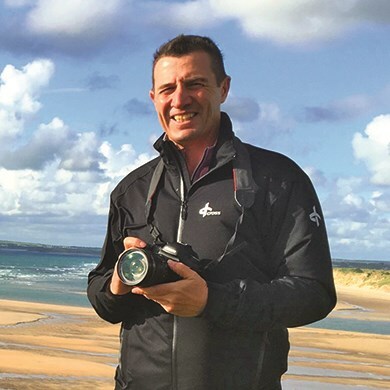 Faldo has suggested a nest of bunkers in the left rough and a bunker midfairway at around 250m, which would definitely provide a more strategic test. At 219 metres, this par 3 plays a lot harder than its rating. A long green with a narrow opening demands an accurate tee shot. A severe slope left will no doubt catch any slightly errant shot. Bail out left is an option, though presents a difficult chip to in order to salvage par. Two small pines either side of the fairway frame the beautiful setting for the thirteenth green, with more trees beyond. The theme is repeated from the thirteenth for the fourteenth where two giant 'goal posts' stand just 10m apart in direct line from tee to green. A safer route to the right presents a more challenging approach. The fifteenth hole is a par 3 of 179m over the course's water storage dam to a hillside green. A recent lengthening of the hole brings the large centre fairway trap into play, however shouldnt affect the longer hitter. A tee shot positioned right of centre will benefit the second shot, due to an imposing left greenside trap. A relatively flat putting surface is difficult to hold; dont carry the approach all the way to the flag. The seventeenth is a short par 5 of 478m, but the challenge is to negotiate the diagonal fairway bunkers and then the creek crossing. The final hole is a strong 423m par to another superb large and sloping green with surrounds that demand great touch to save par from those who miss the putting surface with their approach. 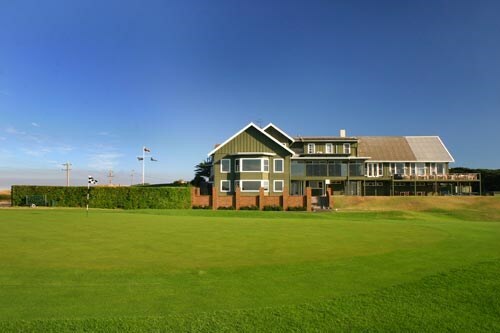 Golf Retreats Torquay offer luxury accommodation and golf oriented holiday packages, and is located within walking distance to The Sands Torquay and close proximity to a number of other Surfcoast golf courses.